Prositions Wins a Prestigious Award from Brandon Hall Group for Mobile Learning Technology | Prositions, Inc. Prositions Wins a Prestigious Award from Brandon Hall Group for Mobile Learning Technology | Prositions, Inc.
Prositions, Inc., a leading provider of training content and technology, won a coveted Excellence in Technology bronze award from Brandon Hall Group for the Best Advance in Mobile Learning Technology with their creation of DashTrain. DashTrain is designed with a true mobile-first architecture and contains over 3,000 micro-video and audio learning bites on 20 of the most sought-after training topics. The mobile application makes the learning content accessible to employees who work without a desk or who are difficult to reach with traditional training approaches. 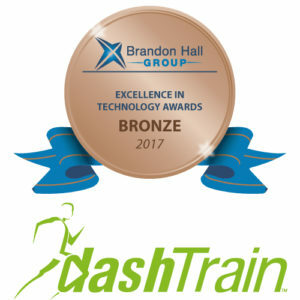 DashTrain was also designed to work in harmony with existing learning management systems (LMS) and other technology platforms and can be accessed by almost any desktop, laptop, tablet, or smartphone. Its intuitive design makes implementations and rollouts simple and quick, with no end-user learning curve. ● Product: What was the product’s breakthrough innovation? ● Unique differentiators: What makes the product unique and how does it differ from any competing products? ● Value proposition: What problem does the product solve and/or what need does this product address? ● Measurable results: What are the benefits customers can expect to experience as a result of using this product?